Seen at a recent Surf City annual car show. C&C welcome. Very nice capture and good exposure. But that is not what grabbed me in this photo the thing need a front fender and is a little distracting looking at that with out one, looks like its being overhauled and not finished yet.... But its a very nice capture on its own. Nice capture as always Walter. Question for you though... I thought it never rained in southern California, at least according to the song, so how do you get so lucky to have the water for the reflection? Well, it has been an unusually cool and wet year overall. Either climate change or La Nina, or both. 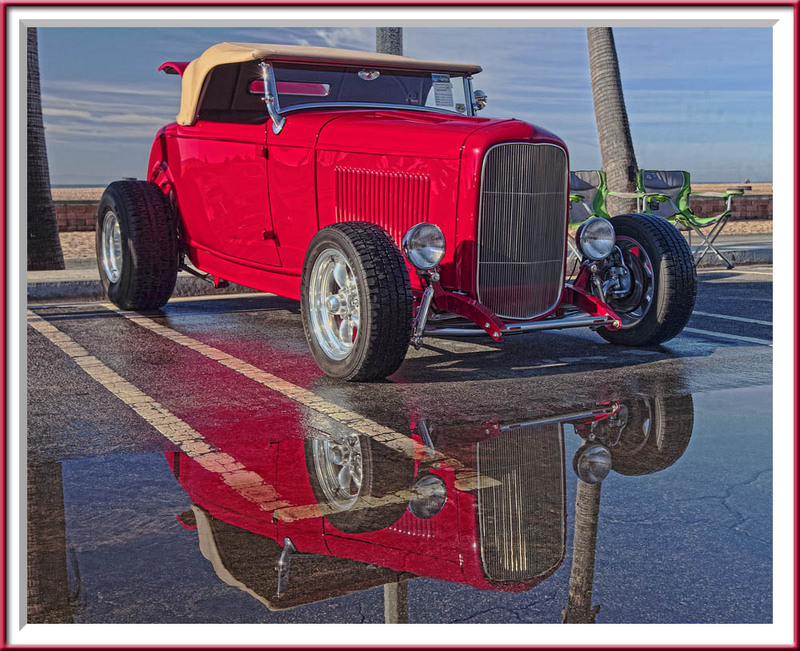 It had rained the night before this very big car show here in HB, and on into the early morning hours. It looked like the event was a rain-out, but it stopped and we had a beautiful day for the show. Walter, I gotta tell ya, I normally don't comment on auto photos (although I DO occasionally view them - they just hold an interest for me), but this is really a terrific image! Very nice capture and good exposure. But that thing needs a front fender and is a little distracting looking. In So. Calif. we refer to these as fenderless roadsters and they are very popular. I personally prefer the fenders. I will trade Rain for the snow we are getting any day.